John Alleyne, the ever surprising and experimental artistic director of Ballet British Columbia, launched the world premier of his own interpretation of Carmina Burana. A fitting musical score was arranged by Carl Orff. This is a highly complex and lush work requiring elaborate sets and a large company. Alleyne circumvented the usual display with a minimalist approach. Named after the Bavarian monastery Benediktbeuron where the 13th century song manuscripts were found in 1803, Carmina Burana is a valuable document of the Middle Ages. 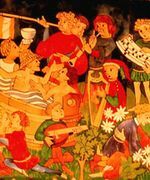 The authors were anonymous composers, minstrels, monks and troubadours. What they weaved together is a classic glimpse into life and experience. An overriding theme in the work is the fragile destiny of mankind, in a world we so little control. Elements of the ballet focus on Fortune, Spring, Love and Celebration in the face of adveristy. Alleyne, at the helm of Ballet BC since 1992, is well known for tackling experimental themes that occasionally rock the complacent world of ballet. Alleyne understands both sides of the ballet world having also worked as a dancer with the National Ballet of Canada before being consumed relatively young by the challenge and joy of creating dance. In a previous interview, Alleyne described his early delight in elementary school when he started painting. His work today is painting of a different sort, creating color and movement with dancers instead of a brush. The staging was darker in color and mood, reflecting the interpretation of well known set designer Darren Waterson. The music was emotional and beautiful, a tribute to The Ballet BC orchestra, Vancouver Chamber Choir, Vancouver Childrens Choir and the UBC University Singers. The Ballet BC dance corps were impressive in their ability to dance physically demanding roles and portray the necessary range of intense emotions that permeate Carmina Burana.